Child, Preschool; Child Development Disorders; Attention Deficit Disorder with Hyperactivity; Autism Spectrum Disorder; Oman. Objectives: Early diagnosis and prompt treatment of mental and behavioral disorders in preschoolers is critical for a better prognosis, ultimately leading to improved quality of life for both the child and the family. Our study investigated the clinical profile of mental and behavioral disorders in children < 7 years of age, seeking consultation at Sultan Qaboos University Hospital, Muscat, Oman, between 1 June 2006 and 31 December 2010. The objective was to explore demographic variables, intervention types, and annual trends. Methods: This retrospective, descriptive study was conducted by reviewing the electronic records of preschoolers seeking consultation on mental and behavioral disorders at the Department of Behavioral Medicine. The diagnosis was based on the Diagnostic and Statistical Manual of Mental Disorders (DSM-IV) criteria. Results: The total number of cases was 466, the majority (77.9%) being boys. The cumulative frequencies and annual hospital-based prevalence rates were estimated for each category of mental and behavioral disorders. Our findings showed increased service utilization among preschoolers, as reflected in the annual trend and case-specific prevalence rates. While comorbidity was common, the most frequent disorders encountered were attention deficit hyperactivity disorder (70.8%), developmental language disorder (23.6%), autism spectrum disorders (20.2%), and disruptive behavior disorders (11.6%). The most commonly prescribed drugs/supplementation were risperidone (18.7%), atomoxetine (9.7%), omega-3 (8.8%), and methylphenidate (6.2%). Conclusions: Consultations for mental and behavioral disorders are being sought for Omani preschoolers. Beside pharmacotherapy, other interventions, which are an integral part of a much desired multidisciplinary approach should be introduced. Readdressing the missing needs is essential for a comprehensive approach to managing mental and behavioral disorders. The data on the magnitude of common childhood adversary has emanated predominantly from affluent and industrialized countries of Western Europe and North America. However, only a few diagnostic studies concerning preschoolers have been published in the West, five from the USA and one from Norway.6 Little information is available regarding the mental and behavioral disorders of preschoolers in developing countries or emerging economies, where the majority of the world population resides.7 In many developing countries, including Oman, there is a preponderance of youngsters in the population structure. Oman is ranked 48 (out of 230) in the global population growth rate with the demographic profile characterized by a ‘youth bulge’, as 22% of the population is under the age of 15 years.8 On the health front, Oman also provides universal free health services for all citizens, and Omani youngsters bear all the benefit. According to the World Health Report,9 “over 98% of births in Oman are attended by trained personnel and over 98% of infants are fully immunized”. The improvement of socioeconomic status in Oman during the last four decades is reflected by the increased life expectancy, jumping from 60 years in the 1970s to 74 years recently. The under-five mortality rate has dropped by a staggering 94%. The improved standard of living has coincided with the ‘baby boom’10 and some challenges in safeguarding the welfare of children. Mental and behavioral disorders of children and adolescents have been reported in Oman with a variation in magnitude. Some of these disorders probably stem from a culturally specific odium of distress.9,13,14 Al-Busaidi et al,15 reported that 27.7% of Omani youngsters had depressive symptoms as indexed by Patient Health Questionnaire. On the other hand, Jaju et al16 and Afifi et al17 conducted a nation-wide survey among students and found 16–17% of youngsters in Oman had clinical depression as elicited in the Child Depression Inventory. While it is clear that the magnitude of cognitive, social, and emotional development disorders in Oman is on the rise, it is worrying that many do not seek care from qualified mental health professionals.13 What was deemed as cognitive, behavioral, and emotional disorders, were largely in the prerogative of traditional healers. Many children or youngsters who appear to have something akin to mental and behavioral disorders are left of their own accord. Some preliminary studies indicate that having a child with special needs tends to have an adverse effect on quality of life for caregivers in urban regions in Oman.18 The question remains of the characteristic of those who do seek consultation with a mental health specialist. Studies are required to document the profile of mental and behavioral disorders among preschoolers attending a tertiary care hospital in Oman to lay the groundwork for prevention and intervention schemes. Our study aimed to document the following: (i) the distribution of diagnoses, (ii) the socio-demographic profile, (iii) the types of intervention, and (iv) the annual rate of attendance of preschoolers seeking consultation in a tertiary care hospital during 2006–2010. This retrospective, descriptive study was conducted at the Department of Behavioral Medicine outpatient clinic, Sultan Qaboos University Hospital (SQUH). At the time this was the only center catering for the needs of children with mental and behavioral disorders. Up to 2014, it received youngsters referred from all over the country. A structured form was designed to extract the required information from the hospital’s health information system. The electronic medical records of preschoolers (children < 7 years old), who were registered at the clinic from 1 June 2006 to 31 December 2010, were reviewed and included in the study. All cases were anonymously treated and put as numbers in the data lists. The inclusion criteria consisted children of both genders, under the age of seven years, who were seeking consultation for mental and behavioral disorders during the prescribed period. Any cases with missing information were not included in the study. Sociodemographic data was taken from the electronic medical record. Medical notes were extracted, including the first clinical impression about the diagnosis. The final diagnosis was made following a protracted discussion among team members. Each case was reported once only, whether it was a new or follow-up case. For brevity, the diagnoses were reported according to the Diagnostic and Statistical Manual of Mental Disorders, fourth edition (DSM-IV).19 Sociodemographic characteristics and diagnoses of mental and behavioral disorders were compared between males and females. The types of medications prescribed, and the number of children in each age group was reported. The variation of clinic attendance over the study period between the groups was also compared. All statistical analyses were performed using SPSS Statistics (SPSS Statistics Inc., Chicago, US) version 16.0. The results were expressed as percentages, and chi-square analysis was used for categorical data. The trend variation of the number of cases over the years of study was tested using the Cochran-Armitage test for trend. A cut-off p-value of < 0.050 was used for all tests of statistical significance. The study was approved by the Medical Research and Ethics Committee at the College of Medicine and Health Sciences, Sultan Qaboos University (SR/MED/FMCO/11/01). Table 1 shows the sociodemographic profile of children < 7 years old attending the Department of Behavioral Medicine outpatient clinic from 1 June 2006 to 31 December 2010. Overall, out of the 466 children who attended the clinic, the majority were males (363; 77.9%). The average age of children attending the clinic was 4.4 years, which was similar in both sexes. The caregivers of the children reported having consanguineous marriage in 45.9% of cases. The mean intelligence coefficient (IQ) test score for the tested children (n = 80) was 79.5 and was slightly lower among girls compared to boys (77.2 vs. 80.2). Table 1: Sociodemographic profile of preschoolers attending the child psychiatric clinic, 2006–2010. Table 2 shows the diagnostic break-up of preschool children included in the study. The most common encountered disorder was attention deficit hyperactivity disorder (ADHD) (n = 330, 70.8%) followed by expressive language disorder and autism spectrum disorder (ASD). School-based problems such as learning disorders constituted about 18.7% (n = 87). Disruptive behavior disorders were reported among 11.6% of cases (n = 54), and only 3.0% were labeled as elimination disorders (enuresis and encopresis). Emotional disorders such as anxiety, depression, and phobias were reported among 1.9% of cases. The least reported cases were child maltreatment (0.6%) and sleep problems (0.4%). Table 2: Distribution of diagnoses of the preschoolers attending the behavioral medicine outpatient clinic, 2006–2010. ADHD: attention deficit hyperactivity disorder; ASD: autism spectrum disorder; NOS: not otherwise specified. Table 3 and Figure 1 show the distribution of attendees stratified by year of attendance. Overall, there has been a striking increase in the number of cases from only 68 cases in 2007 to 148 cases in 2010 representing an increase of almost 218% over four years. Figure 1 shows the change in the attendance trends among boys and girls, which showed similar trends of increase (p = 0.020). Table 3: Yearly outpatients’ attendance to the behavioral medicine outpatient clinic, 2006–2010. 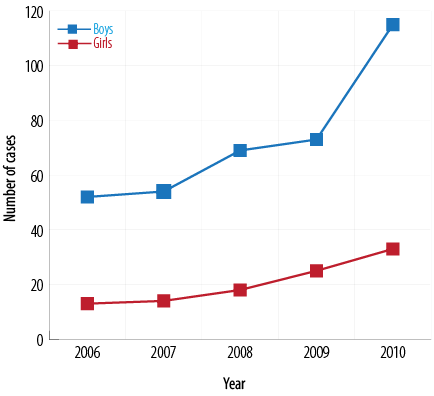 Figure 1: Distribution of patients attending the behavioral medicine outpatient clinic, 2006–2010. The most commonly used medicines/supplementations prescribed to preschoolers were: risperidone (18.7%), atomoxetine (9.7%), omega-3 (8.8%), methylphenidate (6.2%), and imipramine (5.2%). The majority of patients were given drug monotherapy [Table 4]. Table 4: Types of medications used among the outpatient preschoolers attending the behavioral medicine outpatient clinic, 2006–2010. The second sociodemographic profile explored in this study was the cultural practice of consanguinity. Traditionally, consanguinity in Oman can be first- and second-degree cousins’ marriages. This study found that approximately 46% of attendees were born from consanguineous marriages, which is in agreement with local studies recording consanguinity rates of 48%–52%.11,14 This rate of first and second cousins marriage is higher than the rate in the general population, which is 36%.24 Other studies conducted in the region appear to be consistent with this trend in Oman.25 The attendees’ parents reported a positive family history of behavioral disorders in 36.9% of cases. Such high figures have also been reported in other studies conducted in Oman and the region.11,26 This high inbreeding rate is not surprising, as it is well-known that consanguinity is high across all Middle Eastern countries, and some studies indicated that it is the highest in the world.27 Although there is a temporal relationship between consanguinity and some adversaries in childhood, it is worthwhile to note that mental and behavioral disorders appear to be common even in societies with low consanguinity rates.28 Related to consanguinity, this study also suggested that a family history of psychiatric disorders was a risk factor for mental and behavioral disorders in preschoolers. The second aim of this study was to explore the distribution of diagnoses among preschoolers. The prevalence of hyperactivity has been drastically increased recently compared to the past, where something akin to ADHD was known as “minimal brain damage” or “minimal brain dysfunction”.29,30 Various factors have been speculated to account for the emerging epidemic, including the fact that ADHD harbors a social stigma compared to other mental and behavioral disorders among children and adolescents. The high number of ADHD cases in Oman is seemingly consistent with international trends.6 An epidemiological survey of a schoolgoing population indicated that one in five had ADHD.31 Other factors included increased awareness and easy access to diagnostic tools.12 In the past, ADHD was thought to be the disease of affluent societies, specifically in North America and Western Europe. However, ostensible racial/ethnic disparities exist in the diagnosis of ADHD.32 Emerging evidence suggests that ADHD is a global challenge, as our study indicates. It is worth noting that parents in the Arab/Islamic countries usually tolerate to a large extent the “hyperactive” behavior of their children. They consider the child’s activity as a sign of good health, which will vanish with added maturity. However, when the hyperactivity is severe, and the child’s impulsive-hyperactive behavior becomes dangerous to his/her life, causing repeated domestic accidents,11 the parents feel obliged to seek help. The second most diagnosed disorder observed was expressive language disorder, which is a communication disorder characterized by varying degrees of speech and writing impediment. Among disorders that fall under expressive language disorders are expressive language, mixed receptive-expressive language disorder, and stuttering and phonological disorder. The definite etiological factors of these types of communication disorders are unclear, but it is likely to develop as a result of the interplay between hereditary and environmental factors. It is important to emphasize that one of the main environmental factors that negatively affect language development in Oman and other Arabian Gulf Countries, is the phenomenon of letting foreign caretakers raise children at an early age, which is widely practiced due to parents’ employment, the scarcity of nurseries, and social prestige. This will deprive the child of a “normal environment” through inadequate communication and learning of his/her mother-tongue. This leads to a noticeable delay in language development, brought by the lack of stimulation. Moreover, the possibility of child maltreatment by these caregivers, which has frequently been reported in Oman and the region, will negatively affect the child’s cognitive, social, and communication development. Among the many and varied expressive language disorders, stuttering may be worthwhile to consider in the context of Oman. According to some available literature, there is a strong relationship between social phobia and some subtype of stuttering. In Oman, previous studies have suggested that social phobia is common and has been estimated to be bordering 50% among school children.33 It has been speculated that some societies, like those in Oman, tend to foster social behavior, characterized by social avoidance. Accordingly, this might stem from the society’s over-reliance on shame as an instrument of socialization.34 The view is based on the assumption that shame, rather than guilt, tend to reinforce the preoccupation of ‘what others are thinking’. Accordingly, such preoccupation may create mental tension and, in turn, trigger anxiety and somatic distress that render one incapable to articulate some words during a conversation. Accordingly, this might underline the emergence of stuttering. However, stuttering may appear at an early stage of life as a normal developmental process, which disappears afterward. In Oman, specialties that oversee speech and language impediment are generally absent18 and children with such disorders are referred to specialized clinics. This might explain the fact that expressive language disorder is the second most common condition observed in our study. Within the Omani context, the type of diagnosis appears to differ from those observed in North American clinics. For example, in the USA, oppositional defiant disorder22 is one of the common presentations in a psychiatric setting. Although it has been widely established that many mental and behavioral disorders owe their origin to neurobehavioral handicap,35 the possibility remains that the role of culture may be shaping their presentation, the type of childhood disorders and, for that matter, the pattern of care-seeking incurred. In Oman, child rearing practice falls under the ‘authoritative/authorization’ types where parents demand total obedience from the child. This is likely to result in two possibilities regarding the presentation: type of childhood disorders and the pattern of care-seeking. On one hand, one could speculate that disruptive behavior is likely to be discouraged by a hierarchical society like Oman since it challenges the authority of the parent. On the other hand, given that children’s misbehavior are not culturally tolerated, this would create the urgency for the parent to seek help. As it is the case, the first line of contact for psychiatric disorders is traditional medicine. Distressed parents are likely to resort to healing practices that owe their origin to Islamic teaching. The population’s structure in Oman is largely pyramidal, characterized by a “youth bulge”. To establish the magnitude of the childhood disorders in Oman, this study sought to quantify the distribution of cases attending tertiary care, stratified by year of attendance. As expected by the sheer number of children, there was a radical increase in the number of attendees during the study period: there was near 218% increase in the number of children seeking help. In addition to the sheer number of children with special needs in the community, it is possible that more parental awareness of the available remedial services may have been an added factor. As far as what is circulated informally, there are few child and adolescent mental health professionals in Oman. According to the Ministry of Health, “there are only 57 psychiatrists and 432 nurses working in or for mental health facilities in Oman”.9 Because of a shortage of practitioners, management/treatment were limited to the ‘biomedical model’. As noted in our study, only pharmacotherapy was available for children with mental and behavioral disorders. The most commonly used medicines in the clinic were risperidone, followed by atomoxetine, omega-3, methylphenidate, imipramine, and amitriptyline. Omega-3 is a well-known food supplement that has been used in the clinic when parents/guardians refuse to use medications. Other medications have been used only in severe cases who exhibited intolerable behavior that disrupted the family setting and affected quality of life, such as severe sleep disorders, violence, and extreme hyperactive risky behavior. However, strict reliance on the biomedical model for the care of child and adolescent mental health needs are likely to be rife with limitations. There is a consensus that mental and behavioral disorders are likely to be precipitated by a combination of social, psychological, and genetic factors. Psychological disturbances in a child may result from problems with other members of the family. Therefore, interventions should target the whole family. This means the approach towards child and adolescent health, whether physical or psychiatric, are influenced by biological, psychological, and sociological (biopsychosocial) phenomena. The biopsychosocial factors are central to the predisposition, onset, course, and outcome of most disorders. More importantly, biopsychosocial factors are of major importance in designing interventions and management plans. The prevailing structure is not equipped to operate within the biopsychosocial model. Therefore, Oman needs to seriously contemplate the development of a multidisciplinary approach to children with special needs,36 which must include different models of intervention, including psychological, occupational, educational, social, and other types of therapies. This can be accomplished by incorporating well-trained allied professionals in the service. At the same time, the establishment of satellite clinics in different parts of the country is vital to screen, refer, and follow-up cases. We recommend that future studies concentrate on follow-up issues, including the response to the intervention provided, the availability of community resources to deal with such children, and the extent of the adoption of multimodal management approaches. Among some limitations in this study, this was a retrospective study, which usually do not have mechanisms to manipulate exposure or outcome measures, and have an inherent difficulty in establishing temporality of events. Secondly, this study was limited to tertiary care, as part of a teaching hospital, located in an urban area. Such a setting is likely to attract a particular group of the population (such as those who are educated and aware of mental disorders, living in urban areas), and any generalization should be considered with caution. High consanguinity and a positive family history of psychiatric disorders were reported. ADHD and poor language development were the most common presentations in this study. Boys exceeded girls in all disorders, except for emotional disorders. In nocturnal enuresis and sleep problems, both genders had equal distribution. The number of preschoolers brought to the tertiary care jumped dramatically during the study period; this necessitates extending adequate provision services in other hospitals to accommodate the increasing number of children with mental and behavioral disorders. The authors declared no conflicts of interest. The study was nested within the project of H.M. Sultan Qaboos Grant and was approved by the Medical Research and Ethics Committee at the College of Medicine and Health Sciences, Sultan Qaboos University (IG/FN/10/01). We would like to acknowledge Dr Zakia Al-Difai and Dr Muna Al-Salmi for their contribution in data collection, and Mrs Salwa Al-Lawatiyya and Mrs Samira Al-Hamdan for helping in psychometric assessment. We also extend our thanks to Mrs Ishita Gupta for manuscript editing, the patients and their parents, and finally to the hospital administration. 1. Hecht HS. “The child is father of the man” (William Wordsworth, 1802). J Am Coll Cardiol 2012 Oct;60(15):1371-1373. 2. Denholm R, Power C, Li L: Adverse childhood experiences and child-to-adult height trajectories in the 1958 British birth cohort, Int J Epidemiol 2013: Oct:42(5):1399-1409. 3. Kelly-Irving M, Lepage B, Dedieu D, Bartley M, Blane D, Grosclaude P, et al. Adverse childhood experiences and premature all-cause mortality. Eur J Epidemiol 2013 Sep;28(9):721-734. 4. Al-Jawadi AA, Abdul-Rhman S. Prevalence of childhood and early adolescence mental disorders among children attending primary health care centers in Mosul, Iraq: a cross-sectional study. BMC Public Health 2007;7:274. 5. Elhamid AA, Howe A, Reading R. Prevalence of emotional and behavioural problems among 6-12 year old children in Egypt. Soc Psychiatry Psychiatr Epidemiol 2009 Jan;44(1):8-14. 6. Wichstrøm L, Berg-Nielsen TS, Angold A, Egger HL, Solheim E, Sveen TH. Prevalence of psychiatric disorders in preschoolers. J Child Psychol Psychiatry 2012 Jun;53(6):695-705. 7. Al-Shookri A, Al-Shukaily L, Hassan F, Al-Sheraji S, Al-Tobi S. Effect of Mothers Nutritional Knowledge and Attitudes on Omani Children’s Dietary Intake. Oman Med J 2011 Jul;26(4):253-257. 8. United Nations. World Population Prospects: The 2012 Revision. [cited 2014 October 13]. Available from: http://esa.un.org/unpd/wpp/unpp/panel_indicators.htm. 9. Ministry of Health in Oman. [cited 2014 October 13]. Available from: https://www.moh.gov.om/documents/16506/117700/CH01Y13/5ddabfab-f9b3-44eb-b89b-6d1d6b7c9bac. 10. Arab Human Development Report 2009 Edited by UNDP. [cited 2014 October 13]. Available from: http://www.undp.org/content/undp/en/home/librarypage/hdr/arab_human_developmentreport2009.html. 11. Al-Sharbati MM, Al-Hussaini AA, Antony SX. Profile of child and adolescent psychiatry in Oman. Saudi Med J 2003 Apr;24(4):391-395. 12. Al-Sharbati M. The emergence of behavioral disorders in children and adolescents. Int J Nutr Pharmacol Neurol Dis 2012;2:2. 13. Al Riyami AA, Al Adawi SH, Al Kharusi HA, Morsi MM, Jaju SS. Health services utilization by school going Omani adolescents and youths with DSM IV mental disorders and barriers to service use. Int J Ment Health Syst 2009;3(1):22. 14. Al-Sharbati MM, Zaidan ZA, Dorvlo AS, Al-Adawi S. Characteristics of ADHD among Omani schoolchildren using DSM-IV: descriptive study. J Atten Disord 2011 Feb;15(2):139-146. 15. Al-Busaidi Z, Bhargava K, Al-Ismaily A, Al-Lawati H, Al-Kindi R, Al-Shafaee M, et al. Prevalence of Depressive Symptoms among University Students in Oman. Oman Med J 2011: 26(4):235-239. 16. Jaju S, Al-Adawi S, Al-Kharusi H, Morsi M, Al-Riyami A. Prevalence and age-of-onset distributions of DSM IV mental disorders and their severity among school going Omani adolescents and youths: WMH-CIDI findings. Child Adolesc Psychiatry Ment Health 2009;3(1):29. 17. Afifi M, Al Riyami A, Morsi M, Al Kharusil H. Depressive symptoms among high school adolescents in Oman. East Mediterr Health J 2006;12(12)(Suppl 2):S126-S137. 18. Al-Farsi YM, Waly MI, Al-Sharbati MM, Al-Shafaee M, Al-Farsi O, Al-Fahdi S, et al. Variation in socio-economic burden for caring of children with autism spectrum disorder in Oman: caregiver perspectives. J Autism Dev Disord 2013 May;43(5):1214-1221. 19. American Psychiatric Association. Diagnostic and Statistical Manual of Mental Disorders, (DSM-IV-TR, revised text). Washington DC; 2000, p.33. 20. Youth – An Undervalued Asset: Towards a New Agenda in the Middle East and North Africa - Progress, Challenges and Way Forward. Middle East and North Africa Region Human Development Department (MNSHD), The World Bank, 2007 (PDF). Retrieved 24 April 2014. 21. Al-Farsi YM, Al-Sharbati MM, Al-Farsi OA, Al-Shafaee MS, Brooks DR, Waly MI. Brief report: Prevalence of autistic spectrum disorders in the Sultanate of Oman. J Autism Dev Disord 2011 Jun;41(6):821-825. 22. Alobaidi AK, Ali NS. Attention Deficit/Hyperactivity Disorder among schoolchildren in Baghdad. J Can Acad Child Adolesc Psychiatry 2009 Feb;18(1):4-5. 23. Lavigne JV, Gibbons RD, Christoffel KK, Arend R, Rosenbaum D, Binns H, et al. Prevalence rates and correlates of psychiatric disorders among preschool children. J Am Acad Child Adolesc Psychiatry 1996 Feb;35(2):204-214. 24. Rajab A, Patton MA. A study of consanguinity in the Sultanate of Oman. Ann Hum Biol 2000 May-Jun;27(3):321-326. 25. Al-Salehi SM, Al-Hifthy EH, Ghaziuddin M. Autism in Saudi Arabia: presentation, clinical correlates and comorbidity. Transcult Psychiatry 2009 Jun;46(2):340-347. 26. Eapen V, al-Gazali L, Bin-Othman S, Abou-Saleh M. Mental health problems among schoolchildren in United Arab Emirates: prevalence and risk factors. J Am Acad Child Adolesc Psychiatry 1998 Aug;37(8):880-886. 27. Islam MM. Effects of consanguineous marriage on reproductive behaviour, adverse pregnancy outcomes and offspring mortality in Oman. Ann Hum Biol 2013 May;40(3):243-255. 28. Merikangas KR, He JP, Burstein M, Swanson SA, Avenevoli S, Cui L, et al. Lifetime prevalence of mental disorders in U.S. adolescents: results from the National Comorbidity Survey Replication–Adolescent Supplement (NCS-A). J Am Acad Child Adolesc Psychiatry 2010 Oct;49(10):980-989. 29. Barkley RA, Peters H. The earliest reference to ADHD in the medical literature? Melchior Adam Weikard’s description in 1775 of “attention deficit” (Mangel der Aufmerksamkeit, Attentio Volubilis). J Atten Disord 2012 Nov;16(8):623-630. 30. Lange KW, Reichl S, Lange KM, Tucha L, Tucha O. The history of attention deficit hyperactivity disorder. Atten Defic Hyperact Disord 2010 Dec;2(4):241-255. 31. Polanczyk G, de Lima MS, Horta BL, Biederman J, Rohde LA. The worldwide prevalence of ADHD: a systematic review and metaregression analysis. Am J Psychiatry 2007 Jun;164(6):942-948. 32. Morgan PL, Staff J, Hillemeier MM, Farkas G, Maczuga S. Racial and ethnic disparities in ADHD diagnosis from kindergarten to eighth grade. Pediatrics 2013 Jul;132(1):85-93. 33. Al-Sharbati M, Al-Adawi S, Petrini K, Bait Amer AS, Al-Suleimani A, Al-Lawatiya S, et al. Two-phase survey to determine social anxiety and gender differences in Omani adolescents. Asia Pac Psychiatry 2012 Jun;4(2):131-139. 34. Okano K. Shame and social phobia: a transcultural viewpoint. Bull Menninger Clin 1994;58(3):323-338. 35. Ford JD, Grasso D, Greene C, Levine J, Spinazzola J, van der Kolk B. Clinical significance of a proposed developmental trauma disorder diagnosis: results of an international survey of clinicians. J Clin Psychiatry 2013 Aug;74(8):841-849. 36. Ouhtit A, Al-Farsi Y, Al-Sharbati M, Waly M, Gupta I, Al-Farsi O, et al. Underlying Factors Behind the Low Prevalence of Autism Spectrum Disorders in Oman: Sociocultural perspective. Sultan Qaboos Univ Med J 2015 May;15(2):e213-e217.